We love the winter. In a country that mostly deals with heat and stifling temperatures, cold weather is a welcome relief. But sometimes, our bodies don’t deal very well with the change in temperature. While we may enjoy it in the beginning, our bodies start feeling the adverse effects of winter soon enough. That’s why it’s important for us to maintain a healthy diet and routine to make sure that the winter isn’t spent in bed. One of the best ways to do this is to make ghee your best friend. Yes, you read it right! Long thought of as the ultimate enemy, ghee is actually really good for you. In moderation, of course. The benefits of ghee in winter will make you run for that ignored can in your kitchen. If you hate feeling cold, you’ll fall in love with ghee. 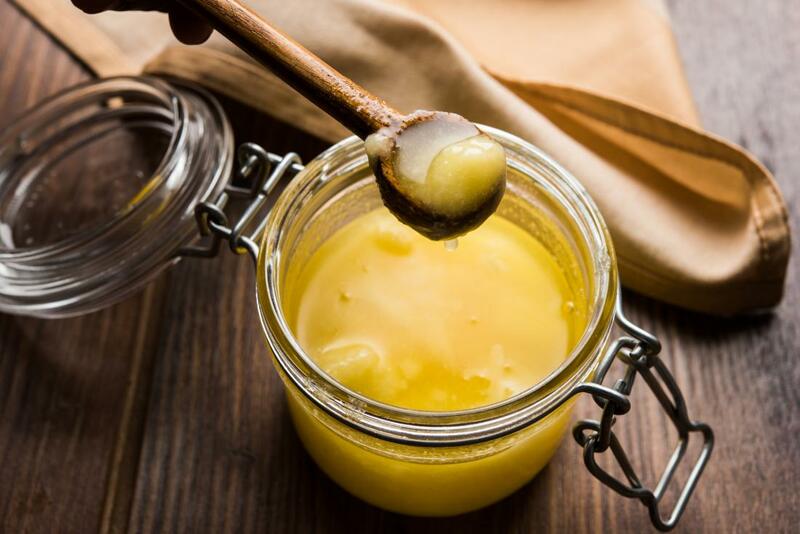 A daily intake of 1 teaspoon of ghee makes sure that your body stays warm throughout the winter. The healthy fats in ghee boost your immunity and keep annoying colds at bay. It can also give you relief from a nagging cough. Heat a tablespoon of ghee, add cinnamon and cardamom to it, and let them infuse. Once the ghee is hot, take it off the heat and remove the cinnamon and cardamom from it. Don’t let the ghee burn. Cool the ghee down to a comfortable temperature. Swallow it and your throat will feel a lot better. Dry and brittle hair is a huge problem in the winter. But if you take the Ayurveda route, this could become a problem of the past for you. Enriched with Vitamin A, D, and E, ghee makes hair stronger from within. Apart from that, ghee also makes for a great moisturiser for your hair. Use a small amount as conditioner after washing your hair with a mild shampoo. If you don’t like the smell, or if it feels too heavy, combine it with olive oil. You can also use this combination before washing your hair for a more intensive treatment. If you are prone to dry skin, we know your pain. When the cold, dry wind hits your face, you can feel the dry spots forming. Ghee is a great way to fix this problem. Use ghee as a makeup remover and as a moisturiser, and your skin will be grateful forever. If it feels too heavy, you can also use ghee as a spot moisturiser. Dab it gently on the dry spots and leave it overnight. Your skin will feel soft and supple in the morning. Everyone hates chapped lips. They hurt! Waking up in the morning with dry lips is an awful feeling, and no amount of water can fix that in the winter. However, ghee will be your saviour. Make a scrub with ghee and sugar, and gently exfoliate your lips with it. Once the dead skin is gone, wipe off the scrub and use ghee as a lip balm. Do this regularly and you’ll never have chapped lips again. Ghee is a great source of energy, especially in the winter. It releases energy slowly so a single helping of ghee can keep you going for a long time. Replace your processed butter with ghee, and you’ll feel healthier and happier. Instead of feeling lethargic throughout the winter, you’ll feel more energetic and prepared to take on the day. A moderate, regular intake of ghee will not make you overweight. It’ll actually improve your health. So stop treating it like the enemy and embrace all the benefits of ghee in winter. What Causes Leg Cramps and How To Deal With Them?